Written by an experienced university teacher, this textbook is based on the author's lectures, and is designed to answer students' questions rather than delving into obscure details. The well-balanced approach gives precedence to a visual, intuitive understanding, with only as much math as is necessary. The author covers the topic of symmetry in crystals from basic elements to physical properties, backed by numerous clear-cut illustrations and easy-to-read crystallographic tables. The result is a compact and self-contained treatment suitable for crystallography courses in physics, chemistry, materials science and biology - irrespective of the academic background. Emil Zolotoyabko is Professor in the Department of Materials Engineering at the Technion - Israel Institute of Technology (Haifa). He is holder of the Abraham Tulin Academic Chair and recipient of the 2001 Henry Taub Prize for Academic Excellence. Emil Zolotoyabko has authored more than 150 scientific publications, one book, and four chapters in books devoted to the development of new X-ray diffraction methods and their applications for studying the structure and dynamical characteristics of different materials systems. Emil Zolotoyabko's book [...] is extremely useful for all who want to get acquainted with crystal symmetry. I found this book extremely valuable and will revise and expand some of the chapters for my lectures. 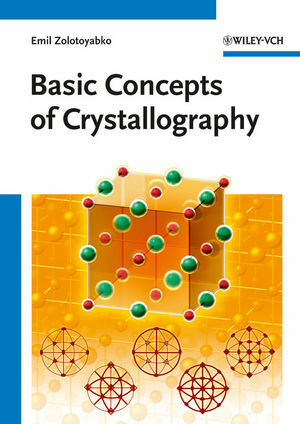 As an introduction to the "Basic Concepts of Crystallography" this book is recommended to any student in science and engineering.